After I compulsively learned everything I could about dewberries last week, I settled in to enjoy the experience. 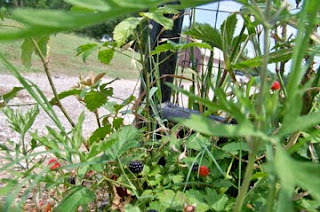 Dewberry pie was good, especially with Blue Bell ice cream. Then I tried Dewberry Cheesecake. After all, I have recently renewed my cheesecake obsession. And Oh.My.Word. Will someone please invite me to a bridal or baby shower? Because I have the perfect dessert to share. 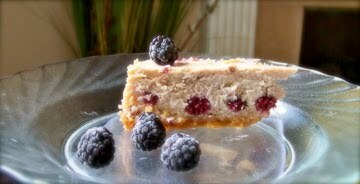 The berry taste was augmented with a splash of blackberry wine, then complemented with crunchy toasted almonds and a dash of cinnamon. Will be making this one again very soon. Note to self: don't use frozen berries for a photo shoot! Five minutes after I put this cheesecake in the oven, my neighbor came to tell me about a patch of berries within walking distance of our house. We have now visited twice, bringing home buckets of berries each time. My freezer loves the attention it has been getting. The kids are becoming pros at berry pickin', especially Miss Boo. Her white school shoes and best gray jeans are now pink from stepping in the berries. Good thing we only have a week of school left! Lulu is already a pro at berry eating. The original stash we discovered out at Red Boot remains deliciously difficult to reach. 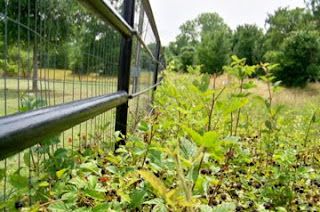 The brambles have grown up quite thick from being undisturbed for several years. The terrain over which they grew is the drainage ditch between the fence and the road. And the thrill of the hunt is accented by the knowledge that copperhead snakes have been known to hang out in that vicinity. But I love a challenge. And I also love the idea of presenting my mother-in-law with a freezer full of berries from her property, and possibly even working with her to turn out dewberry jam or whatever she decides to do with them. So Miss Boo and I keep working, hoping we can collect as many juicy little berries as possible before they are gone. Don't worry, we keep a sharp eye out for snakes.